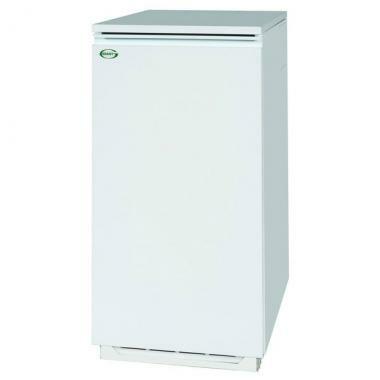 A floor-mounted oil boiler as the name suggests the Grant Vortex Eco Utility 35 boiler is designed to be installed in utility rooms and in homes not connected to mains gas. This regular boiler also known as a heat only boiler can be supplied with an optional sealed system kit which will convert it into a system boiler. It's suitable for homes that have a high heating demand. But there are other options available for homes with a lesser heat demand with outputs ranging between 26kW. The simple controls which are concealed behind a front panel consists of an on/off switch overheat thermostat and a dial so you can control the output temperature. However there's no integrated timer so you will need to install an external programmer or timer. Weighing 121kg the Energy Saving Trust approved boiler measures 90x47x61cm making it too tall to fit underneath a standard kitchen worktop. The Grant Vortex Eco Utility 35 boiler is A-rated for efficiency with a 90.3% SEDBUK efficiency rating. It comes with a standard 2 year warranty although the stainless steel heat exchanger benefits from a length 5 year warranty.